New evidence of heavy elements spread evenly between the galaxies of the giant Perseus cluster supports the theory that the universe underwent a turbulent and violent youth more than 10 billion years ago. That explosive period was responsible for seeding the cosmos with the heavy elements central to life itself. Researchers from the Kavli Institute for Particle Astrophysics and Cosmology (KIPAC), jointly run by Stanford University and the Department of Energy’s SLAC National Accelerator Laboratory, shed light on this important era by analyzing 84 separate sets of X-ray telescope observations from the Japanese-US Suzaku satellite. Their results appear today in the journal Nature. “The combined energy of these cosmic phenomena must have been strong enough to expel most of the metals from the galaxies at early times, and to enrich and mix the intergalactic gas,” said co-author and KIPAC graduate student Ondrej Urban. To settle the question of whether the heavy elements created by supernovae remain mostly in their home galaxies or are spread out through intergalactic space, the researchers looked through the Perseus cluster in eight different directions. They focused on the hot, 10-million-degree gas that fills the spaces between galaxies and found the spectroscopic signature of iron reaching all the way to the cluster’s edges. In Type Ia supernovae the stars are destroyed and release all their material into the surrounding space. The researchers believe that at least 40 billion Type Ia supernovae must have exploded within a relatively short period on cosmological time scales in order to release that much iron and have the force to drive it out of the galaxies. 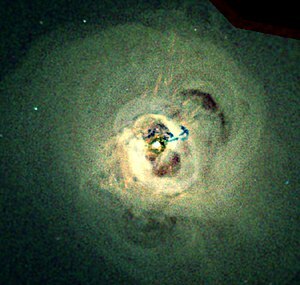 The results suggest that the Perseus cluster is probably not unique, and that iron – along with other heavy elements – is evenly spread throughout all massive galaxy clusters, said Steven Allen, a KIPAC professor and head of the research team. “You are older than you think – or at least, some of the iron in your blood is older, formed in galaxies millions of light years away and billions of years ago,” Simionescu said.